Order 66 was initated without fail, the Jedi fell to those that they led into battle and trusted. Now, that time has passed and the evil grip of the Empire is beginning to take hold of everything, except a small rebellion. Though, The Kaminoans from Kamino had a plan working behind the scenes, to develop a squad of Clones who were no under the command of the Jedi, and were to be there in case civil war broke out from within and the clones were needed for a purpose such as taking down Jedi or sith. These clones were engineered to be able to combat Jedi using their very own brand of Lightsabers and force powers. They were not bound by order 66 when it was invoked, and were taken to Geonosis, hidden away from influence and given a 'general' to lead them on their survival. This clone squad was unique, having clones of both genders, able to wield lightsabers and use force powers. Will they be able to fight past the stories that surround them and show themselves to be worthy of what they were designed to be, or will they fall into the darkness and forever be known as the Phantoms of Order 66. 2. You're allowed up to two characters. Posting rules - The posting rules for this RP are no god modding, which is a given. Force Powers: Sparks has access to a Healing ability, and the ability to set up a force barrier around her friends, though this drains her energy quickly. She also has the ability to use a Battle Meditation, though, she must remained entirely calm and away from danger to use it, inspiring her allies. History: Sparks, like the others in the unit got their genes from unknown 'parents', but were able to use the force like Jedi. Sparks was among the weaker of them in most aspects but combat and strategy. She got her nickname from accidently causing the training room to start malfuntioning and make sparks fly everywhere. Personality: Sparks is a rather quiet individually in most regards, though she will converse with her fellow clones during their journies and their new 'general', and she often refuses to use her Lightsaber due to believing it should be reserved for a more civilized time. "Lightsabers? No. They are for a more civilized time." Weapon: Twinblade Lightsaber, Green Crystal with the 'refinement' being towards an offensive focus. Force Power Focus: Albali is heavily focused on her training and is much more 'support' focused with her abilities, and has a wide range of skills. Most notable are her abilities to give her Allies a force shield and a mental 'barrier' against attacks. Also capable of calming any troubled allies with just her prescence. History: Albali has what some would call, an extended history, but she is rather open about it. 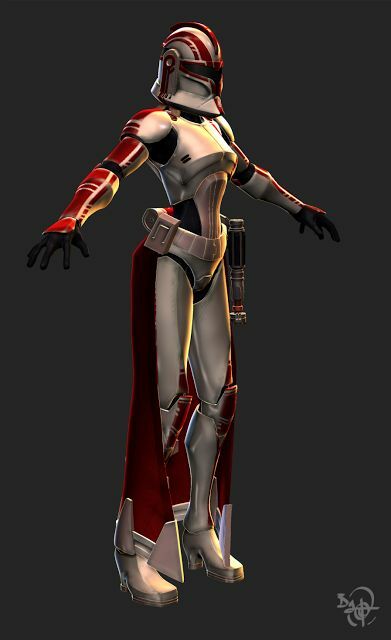 She served with and trained with Bastilla, A jedi from the Old Republic time, and used her time with the young Jedi to learn of her technique, Battle Meditation, even if Albali was incapable of using it herself. During her time in this period, she was known for having a very offesnsive fighting style, which later became known as the Form IV of lightsaber combat, The Ataru style. Focused on dealing with a single opponant and wasn't effective against blasters. 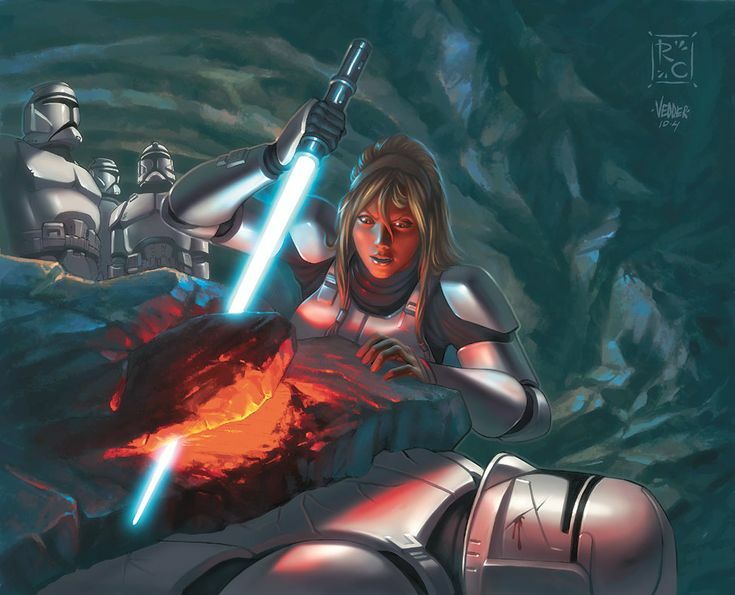 After a battle involving the Sith Lord Reven, Albali was sent into Cryo with a few select soldiers and remained this way until the Clone Wars, where she was woken up again only to find that her 'allies' had a malfuntion in their cryotubes and were killed. She was found by the Jedi Order again and put to work, refusing to lead clones as she found to be unreliable. Her fears were realized with the execution of Order 66 and quickly hid her identity after it was over. Since the order was given, Albali has been searching for some kind of hope, until rumors started to spread of the 'Phantoms of order 66', deciding to search out the Phantoms, her search has led her to Geonosis. Personality: Her age hasn't made her anymore cranky, infact, it seems to have made her more calm, even if she is slightly taken back by the 'newer' generation of Jedi abilities, she lets her resposnes speak for her. Appearance: Sola's hair is naturally an odd mixture of blue and purple. Her mother was half Twi'lek and her father was human. Being one quarter Twi'lek, her slight alien heritage shows through only in her hair. The rest of her is very human in appearance. Her face is young and beautiful by almost any standard. Her eyes are bright blue and melancholy. She is a little over four feet tall and petite in size. She typically wears heavy jackets and warm clothing. This is due to the type of damage her body took at the hands of her old master, so that her body is no longer able to moderate its own temperature. History: Almost 700 years before the rise of Darth Vader, Sola was abducted when she was six months old, by a man that desired power. This man, who called himself Darth Cafus, was not actually a Sith at all. In fact, he was barely a force user. His knowledge of the force was impressive and rivaled that of Yoda, but his midi-chlorian count was barely high enough to give him a rudimentary control over the force. It was for this reason that he took Sola from her parents. Her midi-chlorian count is shockingly high. It is, in fact comparable to Anakin Skywalker's, though not quite as high. Darth Cafus raised her on the planet of Seline. The Jedi star-port, which would later be built there on Seline, did not yet exist. The planet was cold, rocky, and nearly uninhabited. This made it the perfect place for Cafus to train his new apprentice. And train her he did. He taught her everything he knew about the force for 12 years. He trained her to be a vicious and monstrous Sith, but the training simply did not take. While she did develope a lot of fear and anger, she was a naturally stable and controlled person. Despite years of pain and suffering, she never fully gave into the dark side. Then, in an unexpected turn of events, he put both himself and Sola in a cryogenic chamber and set the timer to wake them in one hundred years. Unfortunately the equipment was ancient, and did not function properly. If it had not been for the Jedi activity in the star-port which had been built right on top of their secret burial location, they may have never woke up. After seven hundred years of nightmares about her master, Sola woke up with only two thoughts in her mind, she hated Cafus, and she hated the Sith. To look at her, most might have thought she was a Sith herself. In her armor, she certainly looked like one. She was trained up in the dark side of the force, so no Jedi would have any reason to believe that she was not in fact a Sith at all, but she was not. She refused to use the dark side and, with an impressive display of willpower, she left Darth Cafus alive on the planet of Seline. He ended up being killed by the Jedi anyways. Count me in for this. I'll post a bio shortly. 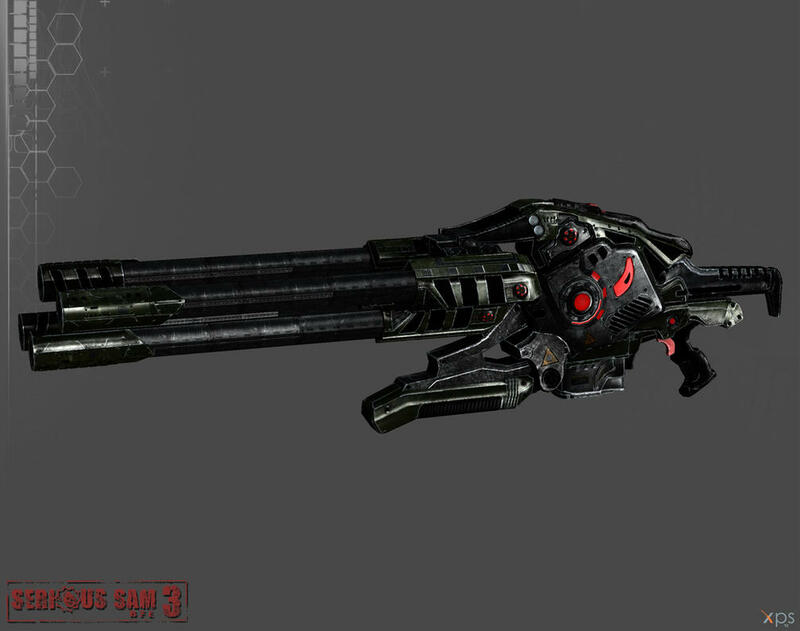 Weapons: Z-6 Rotary Blaster Gun, DC-15 Blaster Rifle and High Explosives. Force Powers: Ash showed no interest in force powers, but has earned perception far beyond that of normal troopers, using the 'Force' to sense enemies around her. 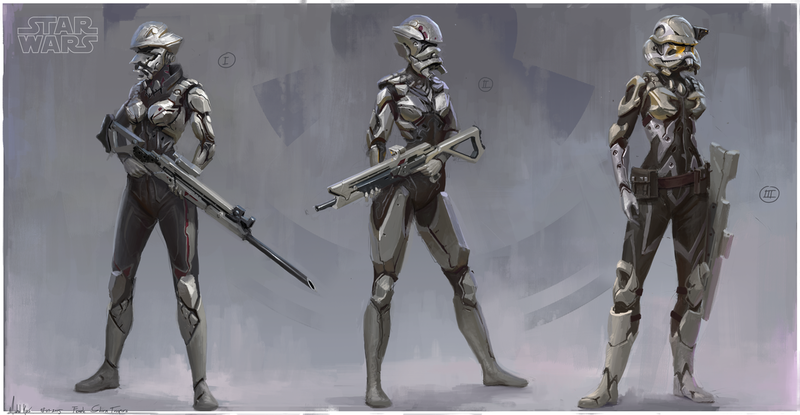 History: Much like the rest of her squad, Ash was born on Kamino through cloning methods, unlike most other clones, Ash was extremely hot headed the entire time, even towards her fellow clones and during a training incident when she got a hold of her signature Z-6 Rotary Blaster gun, she quickly earned herself the nickname Ash when she started to spray everything down to the point nothing but Ash and scrap remained. She refused the use of a Lightsaber, and prefers to keep her distance, not wanting close combat at all. Personality: If she doesn't like you, she won't pull any punches. If she does, You'll know. Very short Temper. I'll have a bio up sometime tonight or tomorrow. Mind if I try to ply my trade at it? I can probably post a bio today. Bio is looking good Ivy. Force Powers: None, though he is slightly force sensitive. Twin personal shields; one is heavily for the use of energy weaponry such as blaster fire, or for more extremes, can withstand a few lightsaber strikes. The other is utilized more for utility, offering a back-up plan for other weaponry or used as an emergency dual layer of shielding; the first having more power than the other. An E-5 Blaster Rifle, modified by cutting down some of the components on the outside of the gun to “streamline” it; making it lighter and easier to handle. It also can be attached with a separate barrel attachment to make it longer to increase accuracy; however, this also requires modification to the trigger to force it to single fire in order to not ruin the barrel. A DD6 Blaster Pistol in a holster on his side, with a modified trigger for more burst-fire use. It is also compatible with the rifle’s attachment, but otherwise has no other modifications. Three total Thermal Detonators, made into “mines” that attach to walls, with a around 10 meter radius each. A single G-20 Glop Grenade, made to explode on contact. Radius of around 6 meters. Two “Flash Grenades” (no name given), coupled with gauntlets that are designed to help take the force of the blast. Two normal knives; one serrated, one with a straight blade. The serrated knife is longer, having a battery connected to it along with a small button switch, allowing electricity to run through the knife’s blade, the hilt made of a material to not conduct the electricity. As a consequence, the switch can only be activated by a tight grip on the hilt to allow the switch to be pressed, making it somewhat unreliable at times. Once pressed, the switch locks the hilt into place until it’s pressed again, disabling the blade. The straight blade knife is around 9 inches long, and the serrated blade is around 1 ft 2 in long. Wears a mask dedicated to life support in the midst of space, allowing him to survive for a limited time without aid; though it also protects him against gas attacks, which he is paranoid about. Also provides limited protection against his own Flash Grenades. As mentioned before, wears gauntlets built to take the kick that the flash grenades have when detonated. Besides that, they’re just reinforced leather gloves. Leg armor is fitted with the belt holding his grenades, and a holster for his blaster pistol, along with his signature shields. He carries back-up rechargable batteries for both of them here as well. He has the knife sheathes on his thighs here. The material is simply small metal plates beneath leggings made out of Bantha hide; fashioned with Cortosis around vital areas such as the knees and groin. Chest armor is made of virtually the same thing, except the Cortosis encompasses mostly a neck brace completely covering the neck, the base of the arms. It holds the holster for the E-5 Blaster Rifle on his chest, with the barrel attachment lined horizontally right below it. Boots are simple; top and bottom layers are made of steel, covered in leather while the inside is comforted by just cloth. A simple man that has been around criminals since he was born, he grew up with a father that taught him the tools of the trade, and with a mother that knew what to get, whatever it was, as long as it was low in price. Uneventful for most of his life, he eventually sought to strike back against criminals that had framed his parents, causing them to be detained for a short while. Utilizing a contact that his mother was acquainted with, this boy of 17 fought and arrested the criminals with the aid of the tools of the trade his father used. Now he is a jack-of-all-trades, doing any odd jobs to pay for this rather expensive equipment, especially a debt caused by the purchase of the Cortosis that is weaved into his armor, with the help of his mother’s contact, now his. He just seeks to get a job done, and do it right; no kills, just injuries, and tries his best to be within the law if it’s practical. He’s not afraid to get dirty though, and will kill if pressed hard. Laid back, just wants payment and a good job to go with it. Tries coercion to get people to go his way in certain situations, but that simply doesn’t work almost all the time, so he is quick on the trigger. However, he always aims to injure and incapacitate, and as such almost always uses the stun function on his blasters. He is also very curious about technology, and personally devised the use of his shield generators by disassembling various droid parts that were in the scrap yards on various planets. Wow... That's certainly a pretty good Bio as a entrance show. Very well, It's accepted. Weapons: Quad-Barreled Laser Rifle that uses a lightsaber energy crystal to create a beam that can pierce through almost any armor. Force Powers: Enhanced Regeneration that allows him to regrow body parts within seconds. Due to genetic tampering, he can use the midochlorian in his blood to increase his speed and strength to the level of some of the strongest jedi. He can also focus force energy in his mouth and release it as a ball of red lightning. 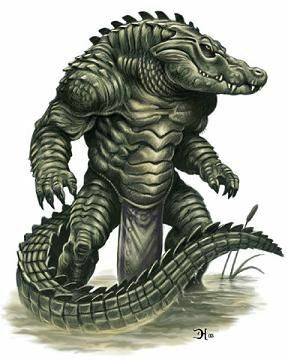 History: Triba was once just a humanoid lizard on the planet Kantillion. His people knew not of war, as they were weak and generally unfit for combat so instead they focused on living in harmony with their home planet. Triba's race believed that their planet was alive, and that by keeping their impact on it to a minimum, they would keep it happy. One day a ship from the heavens crashed into their temple. Inside, Triba's people found a man and began nursing him back to health. When he could speak again, the man used a protocol droid from his ship to communicate. He revealed that he was a jedi that had been seduced by the dark side. He had come to their planet in order to be where the enigmatic Sith Master could not find him. Upon finishing his story, the man looks up to see a massive federation battleship looming in the stars overhead. They had tracked his ship with a homing beacon. Within minutes, droids swarm over the village and begin slaughtering the lizard people. The jedi attempts to fight off as many as he can, but ends up reopening the wounds sustained from his crash. Triba watches in horror as his family is slaughtered, so he takes up the Jedi's lightsaber in an attempt to destroy the droids. Eventually he is gunned down, but saved by the Sith Lord Darth Maul who had been sent by his master to oversee the capture or execution of the rogue jedi. Sensing that triba's blood coursed strongly with the power of the force, Maul transferred him to Dooku, who took the weak lizard boy to Kamino for genetic manipulation. Triba's genetics were strengthened over time. He was trained secretly by Dooku in the ways of the force, and grew from a tiny little twig into a hulking brute. He never took too much to his sith training though, as it defied that flow of nature he had been taught as a child. Dooku attempted to use brainwashing techniques on Triba, but it was already too late. The Lizard man's stubborn mind made him unyielding to the Sith Lord's manipulation, and after 15 years of Sith training Triba broke away from his captors. He stole ship and one of Dooku's spare lightsaber, then took off for Coruscant, a planet he remembered the old Jedi talking about. One his way, he came into contact with a band of bounty hunters who took him on. Finally Triba had found a new home, and thus began his journey into becoming one of the mos feared bounty hunters in the galaxy. Personality: Triba has a menacing appetite for hunting down his targets. He usually doesn't form bonds with those who he feels are weak, but at the same time he doesn't take glee in actual killing. To him, the hunting part is the best part of his job. Every so often, he will return to his home planet (which is Dagobah), in order to pay respect to his dead Kin. Once everyone has a Bio up, I'll post a starter. Force Powers: The only force powers he ever showed any affinity for were telekinesis and Force Sprint that allows him to maintain sprinting speeds for a period of time. Appearance: He is unremarkable in appearance. Standing at average height with a muscular build and average appearance. His hair is black and kept short, his eyes are blue, and he dons basic clone armor. History: Like the rest of his unit he was born through cloning methods. He excelled in most of his combat training lacking any real knack for strategy preferring to follow orders and let his instincts guide him on the battle field. Where others in his squad earned there nicknames for training acdints, Blast received his due to his proficiently with Blasters and his refusal to use a lgihtsaber in place of them. Okay okay. I'm making a Second bio because we have a MASSIVE lack of clones, and a clone who doesn't use lightsabers. I AM FIXING THIS! Fighting Style: While Ice can fight almost any foe with her 'basic' DC-17 Blaster Rifle and it's various attachments, she's taken to fighting with her Twin Lightsabers in a style that is comparable to General Ahsoka Tano. Force Powers: Due to her very aggressive style of fighting with her Lightsabers, Ice has found a set of powers that help her get in close under any situation, using force jumps, shields and barriers to get her in close and then has developed a force repulse power if she needs to buy herself time in close combat. 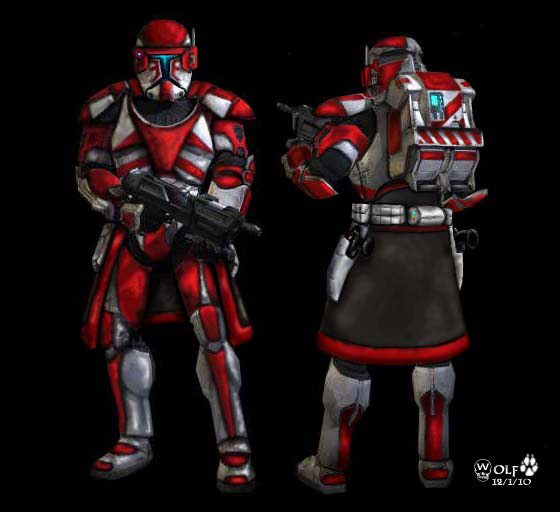 History: Ice was an experiment of an Experiment, the clone creators wanting to see if they could make a Clone Commando who had the powers of a Jedi. While most of the Commando's failed to show any kind of 'force' prowess, Ice and a select few others did and were taken in for the special program. 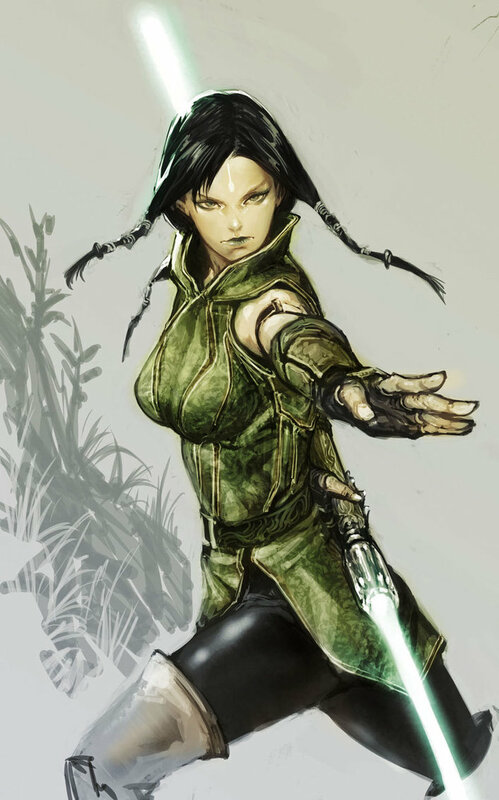 Ice quickly found her fondness for the lightsabers she was given and quickly developed into a fighting style that reminded many of Ahsoke Tano. Ice developed her name from treating both her enemies and her allies the same way. Some of the fellow commando's said: "Sometimes I question if she truly has Ice for blood." Ice soon joined up with the Phantoms of Order 66 when she got lost on Geonosis. Let me know if anything needs changed/elaborated upon/discussed! Weapons: DC-15x Sniper Rifle, DH-17 Blaster Pistol, A Saber Pike featuring a full-length teal blade, with a hilt that can double as a metallic quarterstaff, a short-bladed green Lightsaber, and a vibroknife. Force Powers: His prime skill is in Force Stealth, a power that allows him to cloak himself from view. He's also skilled in use of the Force Mind Tricks, which helps him infiltrate areas of importance better. His last mastered power is the Force Jump, allowing him to reach heights and vantage points to use his rifle from. Appearance: Longshot regularly re-paints his armor to suit the environment his next mission is based in. Generally, he keeps it a dark grey to blend in with urban environments. Under his helmet, he has short-cropped black hair, piercing blue eyes, and a blaster burn across his left cheek from the first and only time he removed his helmet in the field. History: He was originally chosen as a sniper for the unit, and took to it very well. His most notable moment was when he used his sniper to remove an enemy officer from approximately 4000 meters away, earning him his nickname, and establishing his skills as a trained assassin. Personality: To his allies, he's surprisingly open, polite, and even a bit of a jokester, given the opportunity. When dealing with potential hostiles, or discussing enemies, his personality shifts to a far darker tone, wanting to see his opponents dead as soon as possible. The owner of this thread and it's IC has asked to have both deleted. I'm leaving this up for 24 hours so people have a chance to know what happened to it.